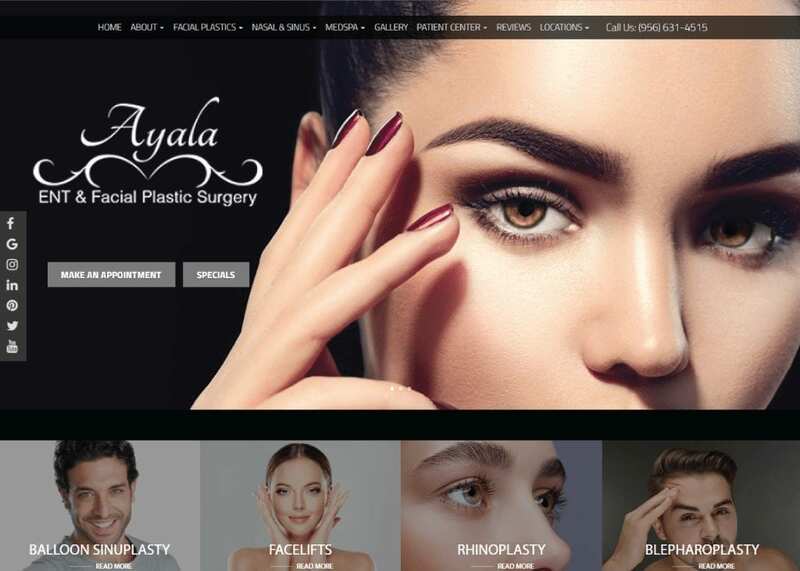 Ayala ENT & Facial Plastic Surgery’s website was designed to provoke a feeling of fashion and elegance, inspiring visions of the beauty and refinement that the services they offer can bring to their patients. Every element of this design lends itself to this goal, leaving the visitor feeling comfortably wrapped in a vision of elegance that is just a visit away. Smoky eyes and long lashes gracing perfectly symmetrical faces greet the visitor in a slowly cycling slideshow. Every picture is infused with a sort of beauty and mystery that promises that ‘this could be you’, inspiring the visitor to see themselves reflected in these images. From the moment they land on the page their imagination is engaged with hopes of things that could be, from a sultry new appearance to a beauty and confidence the likes of which they’ve only read about in romance novels. Dark mysterious shadows coupled with smoldering eyes and lips shining with powerful reds and pinks come together to evoke a certain emotional response from the viewer. The colors do more than just present a beautiful front to the customer, it seduces them from the moment they set foot on the page. Through these doors lay more than a mere plastic surgery clinic, it’s a sorcerer’s tower holding the possibility of performing miracles. The overall design of this website overflows with sophistication and subtlety, ensuring that no individual element is overstated. Nothing in this site overwhelms the beauty of the results presented to the viewer, drawing all their attention to the contents of the slideshow at the top. Even as you progress down the page the colors bring together smokiness and sultriness in even measure, ensuring that the focus remains on the colorized pictures showing the services offered and the possible results. “Don’t tell me, show me” is the foundation of this site’s design, from the slideshow of dreams that initially greets the visitor to the panel of social media links found on the left-hand side. Links to the services available are located at the top, allowing the visitor to immediately go to those areas that interest them, but additional information about those services can be found further down. As you progress down the opening page you’ll notice a list of their qualifications and accolades, culminating in an appointment request panel found at the bottom. This website, from beginning to end, speaks of sophistication and promises of seductive beauty. It immediately draws you in and gets you dreaming about what these procedures could do for you. Every element is designed to evoke a feeling of mystery, imagination, and wonder so that before they even start looking at the services page they begin to fantasize about the new them that will exist after the procedures.